I always love things that are hidden just out of sight. Things that people pass every day with no idea what’s hiding just around the corner. 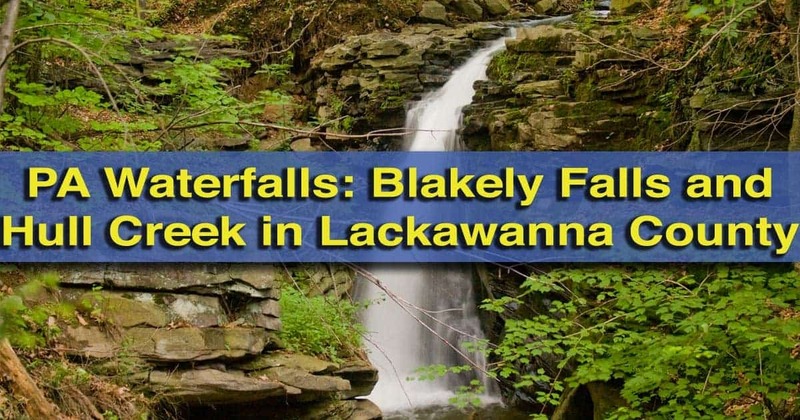 Blakely Falls in Lackawanna County is one of these things. Somehow, this waterfall has managed to remain hidden from all but a few waterfall enthusiasts and, evidently, some local kids. Don’t let a bit of trash deter you, however, from a beautiful stream and a nice hike to a hidden waterfall. What’s great about the hike along Hull Creek to Blakely Falls is how close the trail is to civilization, while still feeling very remote. The path along the creek is overgrown in many places, but is easy to follow and provides great views of this beautiful and interesting creek. The hike to Hull Creek begins from the park around Swansee Baseball Field in Blakely, Pennsylvania (Complete directions below). The creek itself is hidden behind the small park. Over the course of about a third of a mile, the creek has 4 small drops that range from 4-6 feet, as well as a very large slide. Above the slide is Hull Creek’s best feature, Blakely Falls (Also called Hull Creek Falls in some sources). 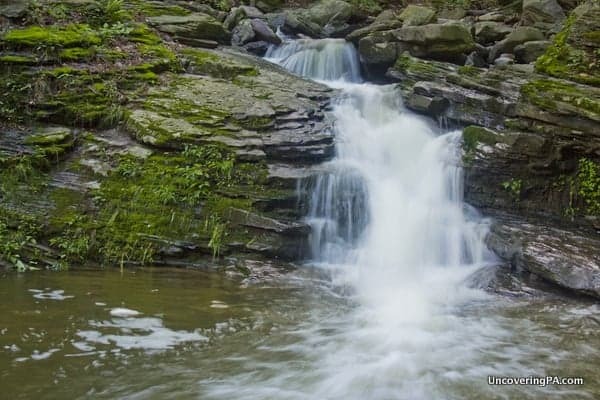 One of the small waterfalls along Hull Creek. 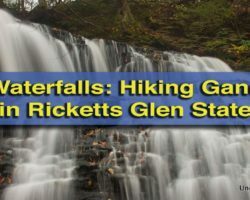 Tucked away in a narrow gorge just below the intersection of Route 6 and Route 347, Blakely Falls is a very nice 12-15 foot waterfall. This is a difficult waterfall to photograph or even get close to, and the trash and road noise distract from the serenity of the scene. 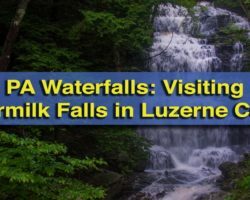 However, if you love waterfalls, this is still a fun one to visit. To get a good look at Blakely Falls, you have two choices. The fist, is to hike up the stream. However, this is made difficult by the large slide just below the falls, and the very slippery rocks in the creek. Getting close is made even more difficult by a 5-foot waterfall about 50 feet downstream from the bigger waterfall. 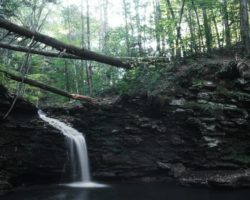 The slide just below Blakely Falls is one of the largest I’ve seen in Pennsylvania. The second choice is to climb the hillside on the left bank for a view overlooking the waterfall, which is what I did. 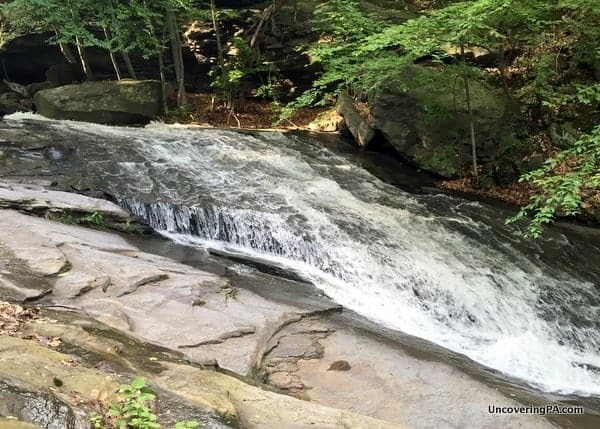 From here, you get a good vantage point for the waterfall, but you can’t get much closer than about 100 feet without risking serious injury from the steep cliffs flanking the creek. Blakely Falls is hard to photograph well, but is a great waterfall to see. While hiking, keep your eyes open for several large holes in the rocks, especially on the far side of Hull Creek. 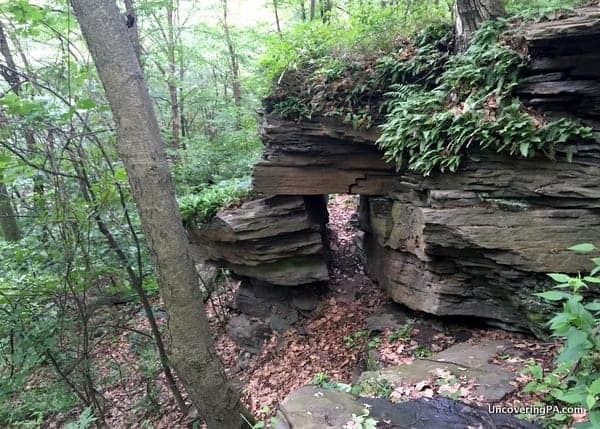 If you hike up the bank to see Blakely Falls, you should also see a very cool balancing rock on your way back down the hill. The gap in the rocks was big enough that I could have fit through, albeit with a bit of squeezing. This very cool rock formation can be seen on the hillside above the Hull Creek slide. 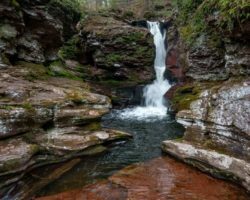 All in all, while Blakely Falls and the rest of Hull Creek aren’t the most scenic or remote waterfalls in Northeastern Pennsylvania, this is definitely a great hike for anyone in the area looking to see something interesting that is a bit off the beaten path. Hull Creek runs behind the Swansee Baseball Field in Blakely, Pennsylvania, just a few miles off of Route 6. Park in the parking lot located at the following coordinates: 41.478976, -75.613881. To get to the creek, you have two options. Another small waterfall along Hull Creek. This one is about four feet tall. The easiest, is to head back down the road to the basketball court. Behind the basketball court, you will see a trail that goes over a small hill, and heads about 30 feet to a gate at the bottom. At the gate, you will notice a large wooden sign that says, “Pennsylvania Archaeological Site 36LW55.” While the creek does have a few interesting things to check out, I’ve been told that the sign was placed there by a local land owner to discourage people from visiting the creek (Which is pretty funny to me, as I was really excited when I saw the sign). 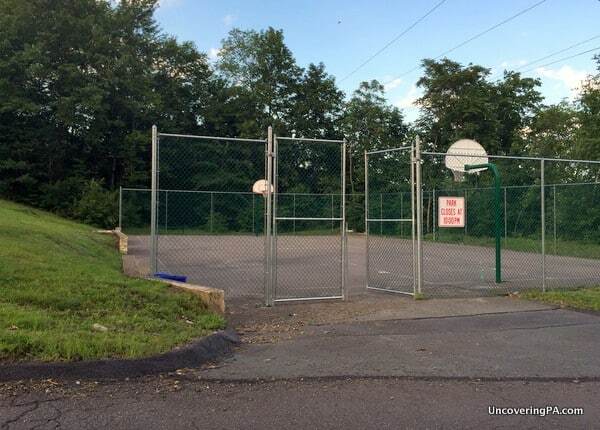 Go behind this basketball court for the easiest access to the trail along Hull Creek. Once you get to the bottom of the hill, follow the obvious trail along the creek upstream to your left. It gets a bit narrow and overgrown in places, but rather obviously follows close to the stream all the way to Blakely Falls. Should you wish to avoid the potential private property, there is another, slightly more difficult route you can go. If you walk behind home plate at the baseball field, you may (or may not) notice a small trail leading downhill. I had a bit of trouble finding the trail to be honest, but just keep in mind that you want to head downhill. If you drew a line from first base to home plate on the baseball field, you would just keep following that invisible line down to the creek below. 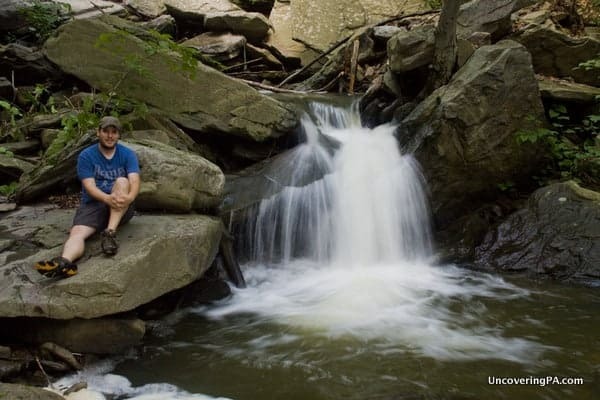 This picture of me should give you a bit of perspective for this 6-foot tall waterfall on Hull Creek. You will shortly run into the trail, but won’t be able to see the creek at this point. Head to your left. To get back, simply retrace your path. It can be hard to find the trail back up to the baseball field, so should you miss it, keep hiking for another 3-5 minutes until you come to the gate, and head over the small hill to your right to get to the basketball court, just down the road from the baseball field. A narrow cave opening along the far side of Hull Creek. I should also note here that I have no idea about the ownership of this land. The home owner’s humorous attempt at controlling access, and the lack of private property signage, leads me to believe that he does not own the property. However, as always, make sure to steer clear of any private property and no trespassing signs, should they appear at a later date. 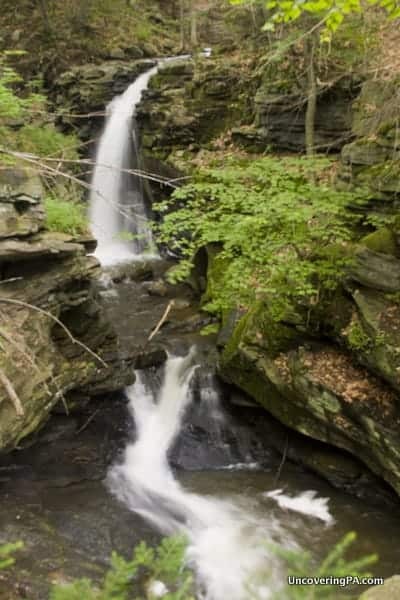 It’s also worth noting that despite the waterfall’s proximity to the intersection of Route 6 and Route 347, there doesn’t appear to be anywhere to park along the roads. 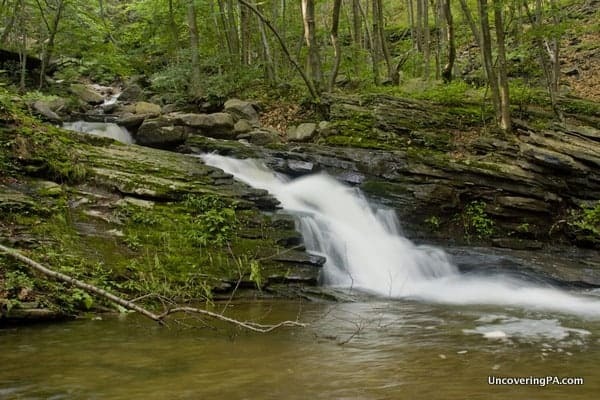 While it would cut down the distance to Blakely Falls, your best bet is to hike up the creek from the community park. 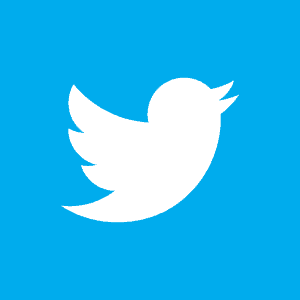 Want to see more things to do in the area? 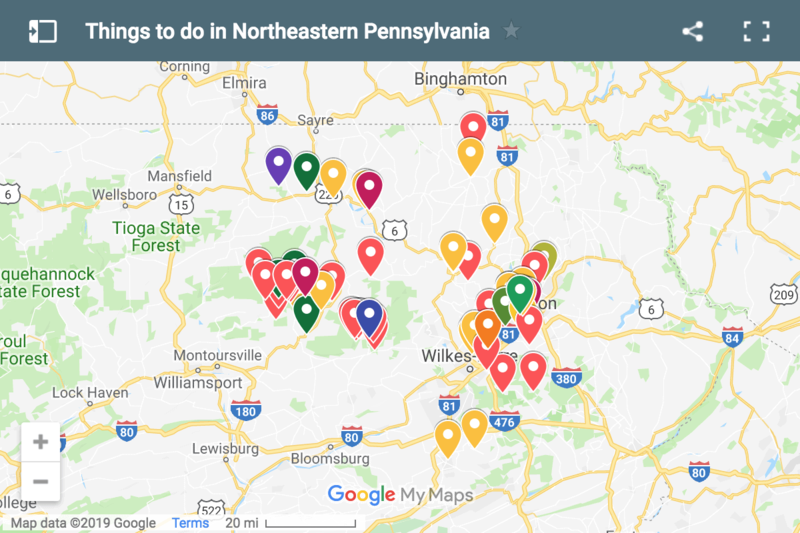 Check out our favorite things to do in Scranton, or the nearby Archbald Pothole State Park, Seven Tubs and Osterhout Falls. Hilton Scranton - The city's highest-rated hotel on Trip Advisor. I lived in a trailer park that was at the bottom of the creek, below the basketball court, from 1984-1997. My spouse and our dogs spent many beautiful days walking the trail to the falls and sitting in the creek to cool off in the summer. 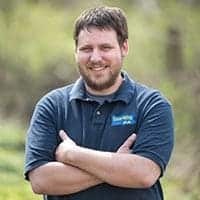 I remember one day when our dog Harpo tried to cross the creek in a particular area and took a slider down the creek into a pool, his ears flying in the breeze. He was not happy that we couldn’t stop laughing at the comical sight and he wouldn’t stay with us on the walk back home. 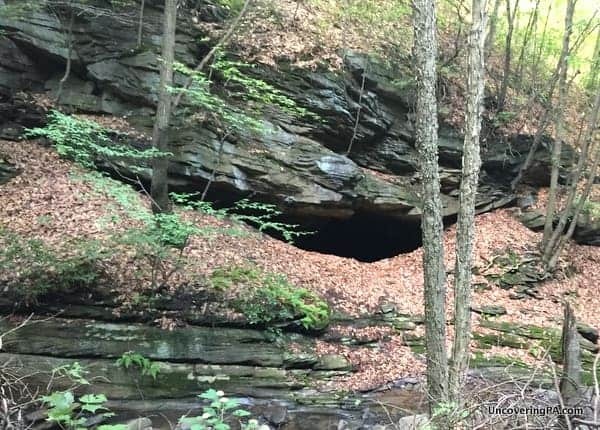 The small cave you pictured has a deep fall off not far from the opening and appears pretty treacherous to explore. While calm and tranquil most of the time, the creek is a raging torrent during heavy rains, like Hurricane Gloria produced. I now live in Texas and this brought back some vivid memories. Thanks so much. Glad you enjoyed the piece, Meredith. I definitely wouldn’t recommend anyone venturing into any dark cave, but they are interesting to look out from the outside. Is it worth fishing in the creek, catch and release? I doubt it, but have no idea. The water wasn’t all that deep, and I doubt the stream is clean enough for native trout. However, you never know if you don’t stick a line in the water. The Falls are owned by St.. Patrick’s Cemetery . Lackawanna County deeds book 896 – page 424. Helped dam the creek up on top of the hill, for a swim pond. wonder if any of it remains. That was in the 40s. We used to walk thru the big drain pipe to get on the other side of the highway. Grandpa is buried in the cemetery across the road. It was a nice little hike from Olyphant. I think I know the dammed up area, its almost all the way up by the Falls. There’s an area that definitely looks arranged. It was the late 90s when I frequented the area and it wasn’t really deep enough to swim but you could wade around if you wanted. That’s interesting about the fellow in the cave. I hadn’t heard anything about that but we didn’t have any old timers showing us around. We had such a gr8 time hanging out at the falls…..lots of memories. …its nice someone reconized a beautiful place like this…?? The falls might be owned by St. Patrick’s Cemetery, but I believe the rest of the creek/gorge is owned by the Doloff family. It used to be a mining creek from the 1800s through the early 1960’s. (Also, I thought it was called “Hull’s Creek”. Contact Maryanne at Lackawanna Historical Society to double check Google Maps is not the end all and be all). As Roseanne Dziki stated, there was the story of a guy we called “The Hermit”. I never knew his name was Bernie. My dad said the same thing about locals bringing him food. He used to have a little rock shelter up the hill from the “dammed up area”. We grew up calling those falls The Castle. But a few years ago, someone had a sign saying there were named “Lightning Falls” in the 1800’s. My dad said mining cars would come down the trail and they would go to an entrance to the mine right in the middle of what is now the trailer park. For all the years I would go down there, it wasn’t until about the year 2002 I discovered an old rail in the ground just down from The Castle. And a few years ago I found another rail in the ground along the trail just down from the baseball field. Do you see where that concrete bridge is located? The earth/ground use to go right up to that bridge. But in the late 70’s I believe, there was a huge storm and flash flood, and it washed out that gulley, and even sent one of the trailers from the park down into the gorge. FYI: nothing to fish in the creek. I grew up down on Columbus Ave. on 2nd st. Corner. I know RoseAnn Dziki. She was 5th and Columbus.At 4th st. Corner there is a dam that holds a torrent where the creek hits town. We would go up from there . Over on Lincoln Ave.we went up the culm dump road which went to St. Pat’s cemetery at rt.6. There was a bend to the left that eventually went over the old crumbling bridge at the creek. When you crossed there was a smaller air vent where we would cool off and the big old shaft entrance was farther up on the left that’s in your picture. Next was the Castle and in the fifties and sixties you could walk up the man made steps that formed it if they weren’t too slippery. Definitely put there for some reason. Then came “the bathtub” which was the big slide into a good sized pool at the bottom. I ruined a pair of cutoff jeans about every week. The place wad a blast. I spent my childhood up there. Up farther on the left hillside there was an old looped cable hanging from a branch…the tarzan swing… but there was no water nearby,just a drop into the woods down the hill. We were nuts. And I know yhat unfortunately there was a HUGE boulder down about 15or 20 yards from the falls that was like a knife’s edge on top and we would crawl out to the front edge just for a hood seat to watch the bathtub. It kind of eroded and fell apart eventually but I haven’t been back in years. Now I have to take my son up for a walk.I’d like yo see what it looks like now. Thanks. I have just discovered this place, after loving on 8th Street for a year now. It is quite a treasure!